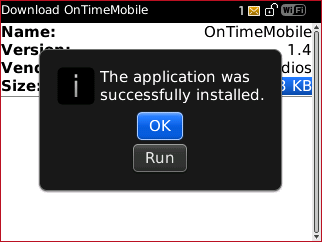 On devices running BlackBerry OS 5 or higher, you can install the OnTime Mobile for BlackBerry application. This application adds useful features to your OnTime experience, such as tracking GPS position even when the program is running in the background. 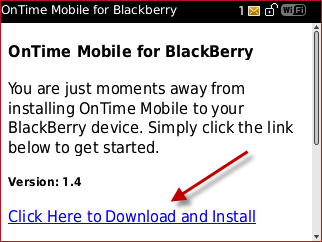 Start the BlackBerry web browser and navigate to this web site address:	www.ontime360.com/bb/. On the resulting web page, click the link labeled: Click Here to Download and Install. When prompted, select the Download button. The download should then start, after which the application will automatically be installed. After a few moments, you should see a message on the screen stating that the application was successfully installed. The OnTime Mobile application shortcut should now appear in either your Programs list or in the Downloads folder. 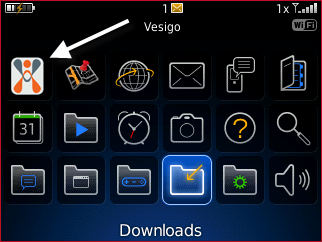 Select the OnTime Mobile icon to launch the program. Once loaded, sign in with your driver credentials. 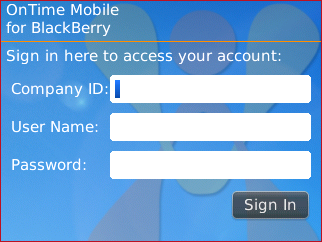 On devices running BlackBerry software older than BlackBerry OS 5, you can use OnTime Mobile Web. OnTime Mobile Web offers an attractive and simple interface, designed to work well on full features web browsers. All essential information and functionality, including two way communication, is included. More sophisticated features, such as signature capture and GPS tracking, are included if the device supports them. Locate your OnTime Mobile Web URL (or web site address). This was included on the welcome email you received when your OnTime account was created. From the BlackBerry device, start the device's web browser. Enter the URL from step 1 into the address bar of the device's web browser. If your BlackBerry device is connected to the internet properly, you should see a log in screen within a few seconds. To make it easier to access OnTime Mobile Web on the phone later, use the browser's bookmark or favorites feature to save the site. Sign in with your driver credentials.